Hunger is on the rise during summer months. Kids are out of school, and without free breakfast and lunch. Electric bills soar as temps rise. And following the devastating impact of Hurricane Matthew, many household budgets are stretched beyond what they normally are, as families work to rebuild their lives. In the summer there is an increased reliance on many of our Partner Agencies (food pantries, soup kitchens, shelters) for food – and on us to restock and replenish our Partner Agencies. While many folks think of food banks around the winter holidays, the highest need occurs in the summer months. This June and July, Food Bank of Central & Eastern North Carolina distributed 10,906,553 pounds of food, nearly 900,000 pounds more than we distributed last November and December. 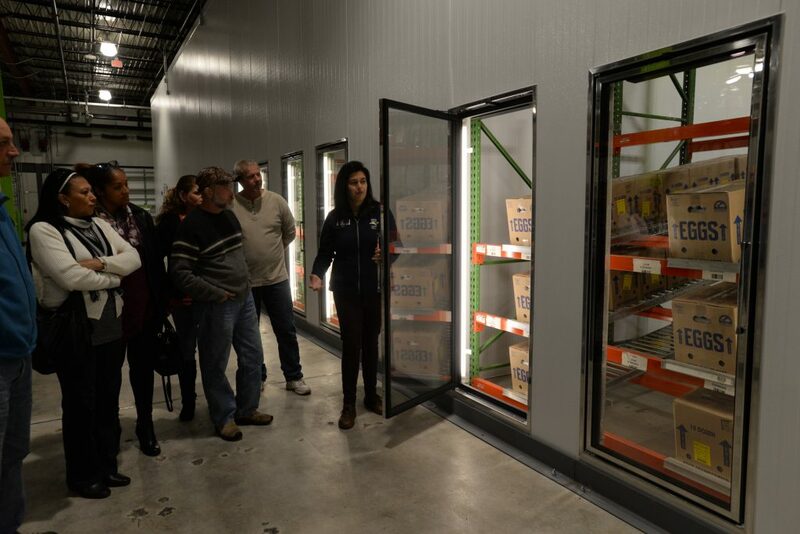 Last Fall our Raleigh Branch relocated into a larger building with triple the freezer and cooler space! We will never have to worry about having room when a farmer calls to say they have surplus harvest to donate. Morgan Stanley’s grant funded equipment purchases that enable us to move more produce, more efficiently: two electric pallet jacks, a scale for a standing forklift, and 67 plastic produce bins. The most exciting of those is probably the produce bins! For food safety reasons, soft-sided produce cannot be kept in wooden bins. 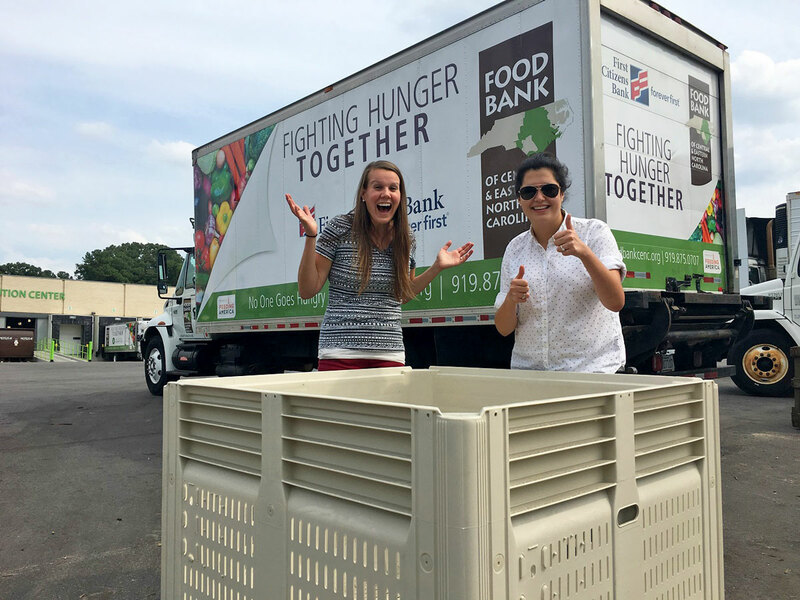 With our new plastic bins, the Food Bank can accept more produce donations from more farmers – resulting in more healthy food for North Carolinians in need. As an added bonus, plastic bins are easily washed, reused, and have longer lifespans than traditional wooden bins. It’s a first-Tuesday and food distribution day at Warsaw Baptist Church. Rosa (not her real name) is in her car with her youngest daughter and in line at 6:30 a.m. It’s already hot, but she’ll wait four-and-a-half hours because she needs the food for her family. At about 10:30 a.m., a 22-foot refrigerated truck from the Food Bank of Central & Eastern North Carolina pulls into the church parking lot and 20 volunteers spring into action unloading the truck, positioning whole pallets of food for distribution, and bagging some items. By 11 a.m. the line is moving. At the first stop, she’s asked to pop her trunk. Volunteers load in bags of potatoes and turnips. At the next stop, it’s cold salad, fresh tomatoes, and carrots. The third stop is fresh strawberries and a cantaloupe. Then the last stop for bread, dry goods, and a case of bottled water. By 1 p.m. more than 10,000 pounds of food, have been distributed. The site is cleaned up like nothing ever happened, but 140 families have come through the line, each receiving almost half a car trunk of food. Scores of people receive food every month in Warsaw because of the Food Bank of Central and Eastern North Carolina. Thank you to Morgan Stanley and all of our supporters for enabling us to provide more produce than ever across our 34 county service area! Stop Summer Hunger is our annual initiative to nourish children, families, and individuals during this season of increased need. In addition to Kids Summer Meals, we work extra hard to keep shelves stocked for our network of Partner Agency food pantries, soup kitchens and shelters who experience an uptick during the summer. 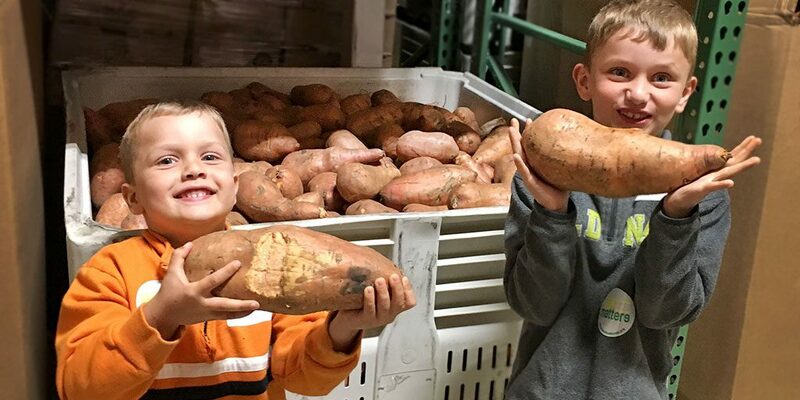 You can help us reach the goal of 3.4 million meals before July 31 and ensure that all our neighbors in need receive the daily, nutritious meals they need to be healthy and strong. Contribute today to our Stop Summer Hunger food and funds drive.